As have been reported to LJNA members, an oil spill occurred into Hamer Bay sometime between February and April 3, 2018 when it was discovered. The spill originated from 9A Appledale Road, sometime after a fire that occurred in February. Upon discovery of the spill the appropriate agencies were contacted and cleanup was immediately initiated. Adams Brothers Construction, a Ministry of Environment, Conservation and Parks (MECP) approved company, was retained and quickly cleaned up any obvious oil and installed floating booms to absorb any additional oil that seeped into the bay. Subsequently, an official clean up order was issued by the MECP and Stantec, an engineering consulting firm with experience in oil spill clean up, was retained by the insurer to design and oversee the balance of the remediation efforts. The clean up, remediation and assessment of impacts have been ongoing. Stantec Consulting Ltd. (Stantec) has completed onsite remedial and restoration activities for the property located at 9A Appledale Road. Upon completion of the remedial program, liquid phase hydrocarbons (LPH) were no longer observed on the surface water of the Creek/Hamer Bay and surface water results met the applicable Provincial Water Quality Objectives (PWQO) and Ontario Drinking Water Standards. In addition, onsite soil results for the Site also met the applicable Ontario 153/04 Site Condition standards. At this time, Stantec is currently in the process of preparing a final report for the Ministry of Environment, Conservation and Parks (MECP) summarizing our remedial efforts and recommendations moving forward. At this time, Stantec will be returning to the site in the early Spring 2019 to recover another round of sediment samples to confirm sediment quality in the area of the point of loss and will provide an update following the completion of this program. At the completion of the follow-up sediment sampling program, a follow-up report detailing the results and any further recommendations will be provided to the MECP for review/consideration. Stantec Consulting Ltd. (Stantec) has completed the drinking water sampling program at 37 cottage properties within Hamer Bay. Copies of the analytical drinking water results have been provided in letter format to each property owner, as well as to the Ministry of Environment, Conservation and Parks (MECP). The analytical results report concentrations of benzene, toluene, ethylbenzene and xylenes (BTEX) and petroleum hydrocarbons (PHCs) below the provincial water quality objectives (PWQOs) and the Ontario Drinking Water Standards (ODWS). All of the surface water samples collected within Hamer Bay have also been tabulated and provided to the MECP and report concentrations of BTEX and PHC (F1 to F4 Fractions) below the applicable standards (PWQO and OWDS). Work in Hamer Bay continues at 9A Appledale Road, in the area of the former boathouse that was recently demolished. Work in this area remains boomed with absorbent booms for a planned dredging program that is being completed to remove residual PHCs in the boathouse cribbing structure and sediment along the shoreline. This work is scheduled to be completed in the next couple of days, with sediment sampling scheduled for next week and analytical results to be reported the following week. Surface water samples will also be collected following the dredging program and analytical results for the sediment and surface water sampling programs will be provided to the MECP. A dredging permit has been obtained from the Ministry of Natural Resources and Forestry (MNRF). Saturday, October 6th - 9:30 am to Noon at the Humphrey Community Centre. Mayoral and Ward candidates will address the audience with their personal message and answer questions. Come hear the platforms and decide how to best cast your vote. LJNA is co-hosting this All Candidates meeting on Thanksgiving weekend with several other lake associations. It is open to all. We hope to see you there. And please encourage your neighbors to come. Residents of Seguin Township have been fortunate that the Seguin mayor and Council have been excellent. Seguin is in very good financial condition. Property taxes (mill rate) are lower than surrounding townships such as TML. The Seguin Official plan puts the “environment first“. And this policy is carried out by measures such as Recreational Carrying Capacity. Your vote is important. Decisions at the municipal level include road maintenance and construction, land use planning, environmental services such as garbage and recycling, and, of course, property taxes! Waterfront property owners represent a significant proportion of the voters in Seguin. Voting opens – October 9th and will continue until October 22nd. Voting in Seguin will be done electronically. This means that you can vote from anywhere in the world by phone or by internet. If you are on the voters’ list, you will receive a PIN and instructions by mail towards the end of September. For more information on how this will work visit the Seguin Election Webpage and click on the topic: Internet and Telephone Voting. Canadian citizens who own or rent property in Seguin are eligible to vote. Contact the Municipal Office (705) 732-4300 or attend in person to check that you and your spouse are on the list. Eligibility requirements are detailed in on the Seguin website (pdf). And in more detail in the 2018 Voters' guide for Ontario municipal and school board elections (pdf). Staff at the Seguin office will help you to apply to be added if needed. Changes and corrections can be made to the close of voting, Oct 22, but it’s easier to do it now. Bruce Gibbons, our current mayor is not seeking re-election. We thank Mayor Gibbons for his leadership and commitment to Seguin over many years. His replacement will have a crucial role in guiding Seguin for the next four years. About 20 residents of Lake Joseph North are in Ward 3. Three candidates have declared: Rod Osborne, the incumbent, Julia Sek and Wiliam Stoneman. Brochures provided by the candidates can be viewed by clicking the links beside their names. Current Ward 4 Councillor Susan Adams is not running for re-election We thank her for her service to Seguin and Lake Joseph residents. Terry Fellner, a long time Lake Joseph resident, is acclaimed for Ward 4. 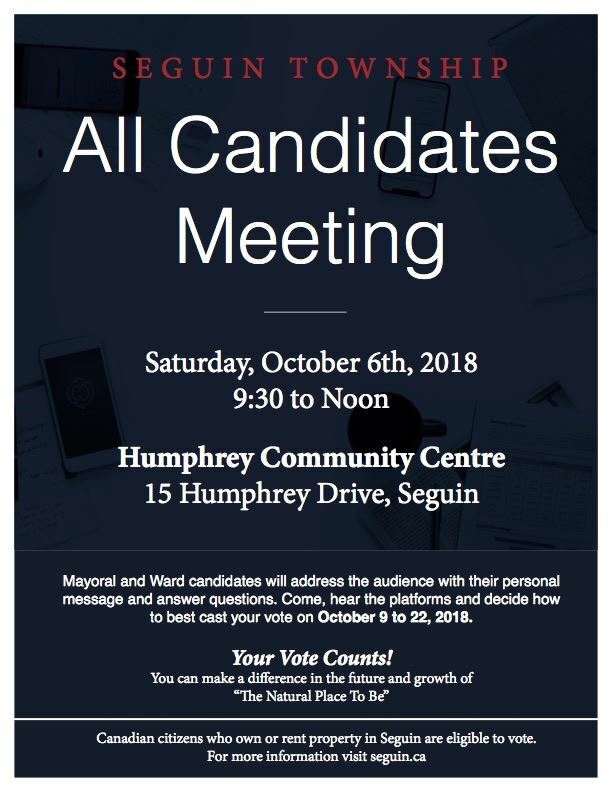 A list of all the Candidates for Seguin council and their contact information is posted on the Seguin Website. Coverage of the election issues can be found on the Parry Sound Northstar Site. Coverage of the Oct 6th All Candidates Meeting can be found HERE and HERE. The MLA's election information including their views on the Seguin candidates can be viewed at this link. More information on their process can be viewed here.